Of Sound Mind and Spirit: Are You Watching The Bible Miniseries? Are You Watching The Bible Miniseries? 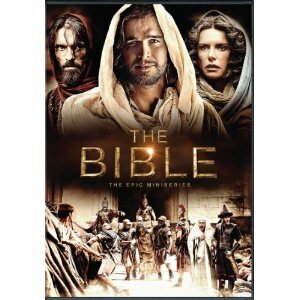 **Update** You can now catch The Bible: The Epic Miniseries on DVD if you missed it originally on TV. By now you've heard the buzz around the new television mini-series, The Bible, on The History Channel. The Bible is the big budget project of husband-wife team, Mark Burnett and Roma Downey which condenses the Bible into a 10 hours of television. Cardinal Wuerl, of the Archdiocese of Washington, who acted as a consultant on the project, captured the essence of The Bible miniseries in his words. "The Bible, the made-for-TV video, seeks to introduce a new generation to the Bible, the great book of the works of God. It does so with great passion, exquisite skill and cinemagraphic triumph. My hope is that this video presentation, The Bible, may bring alive its many stories in people’s minds and hearts so that they may be drawn to rediscover the Bible and rejoice in its saving message." While the first two hour episode aired last Sunday night, my family just recently sat down to watch it on our DVR. Our nine year old son was the one in the family determined to watch The Bible miniseries. First off, I will say this miniseries might not be for all families and children. This is the Bible which is filled with violent stories, especially in the Old Testament. There were moments just in episode one that were intense for my six and nine year olds. Moments which gave me pause on whether or not they should watch it. The children were most bothered by God smiting the city of Sodom and the binding of Isaac. 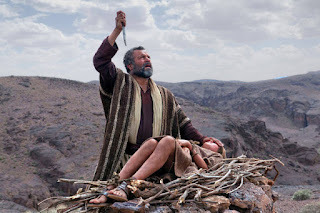 Abraham willing to sacrifice his son, Isaac for God. But their horror at watching a man willing to sacrifice his son at God's Will reflects exactly why The Bible miniseries is powerful. My children know the story of Isaac's binding, they've read it in their children's bibles and Arch story books; however, seeing the visual portrayal of the story made a deep emotional impact. It caused them to really think about what they were seeing and what it meant. We ended up pausing the miniseries to discuss Trusting in God, Sacrifice and God's love for His own Son, Jesus. How many other television shows give families an entry into discussions of scripture and Faith? Not only did it lead us into great family discussion, but The Bible miniseries is extremely well produced and easy to watch. This is not your cheesy religious television show. It is a "Hollywood" production with all the bells and whistles we're used to seeing in our secular media. My only nitpick so far is that since it is "only" 10 hours, they have to skip over and lightly cover some of the bible stories. When the time would jump forward, the kids, my husband and I would pause the show and discuss what we missed. It was so very cute when our six year old jumped up to get her Children's Bible to help out. She then sat with it in her lap turning the pages as the story of Moses developed. I will overlook stories left out because I recognize they had to condense it for television and the Bible stories they do cover, they develop well. If you missed episode one of The Bible miniseries, it will air again on Sunday night just before the premiere of episode two on The History Channel. If you are watching The Bible, what did you think of the first two hours? And, are you watching it with your children? *Update* If you missed the original airing of the Bible Miniseries, you can watch it on DVD from Amazon.